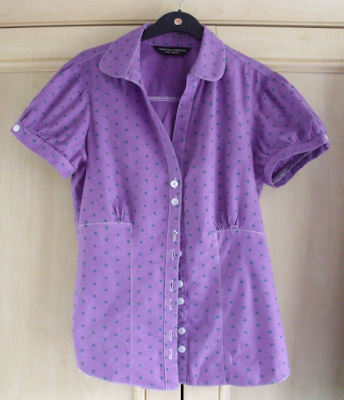 Actually this post is about two customised items, because I dyed both these shirts at the same time. I used one pack of Dylon Fabric Dye for Hand Use in Intense Violet and put both shirts in together but as they were made of different materials and were different colours, the results were drastically different. The above shirt is a cotton/lycra blend, and was originally white with green hearts. The hearts stayed green but the white fabric became the quite bright purple you can see here. The stitching must have been synthetic as it stayed stark white. I really want to change the buttons on this so that they match the purple, because now the shirt is purple the white buttons look really stark and cheap. This one is a polycotton, so the resulting shade is much less vivid. 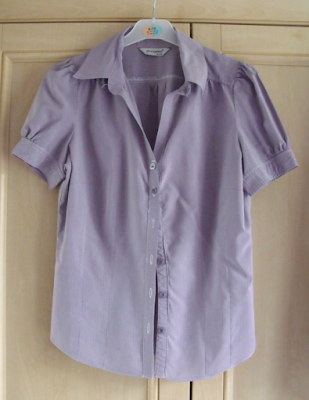 Originally it was light grey with dark grey stripes, hence the lovely heathery lilac it became. I love the results but I think I'll use machine dye in future because I got so fed up of all the stirring, and even though I stirred it regularly and often, the result is still a bit patchy in places. I had to use the washing machine to rinse out the dye because it was taking me so long to do it by hand, so I think I might as well do the whole process in the machine! Have you ever dyed an item of clothing or an accessory? It's really easy and a great way to make old clothes exciting again! Both of these shirts were looking a little worse for wear before I dyed them - the first one was from a charity shop and had a light brown stain on it which was disguised quite effectively by the dye, and the second was a hand-me-up from my sister that she used to wear to school.